For our NIME final concert, I have decided to carry on my idea about Chinese calligraphy after I have discussed with Antonius. 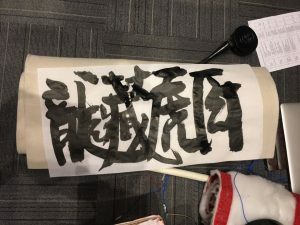 For my last week`s performance, I writed the character “Dragon” with brush in combination with the beats of dragon dance with different rhythm. 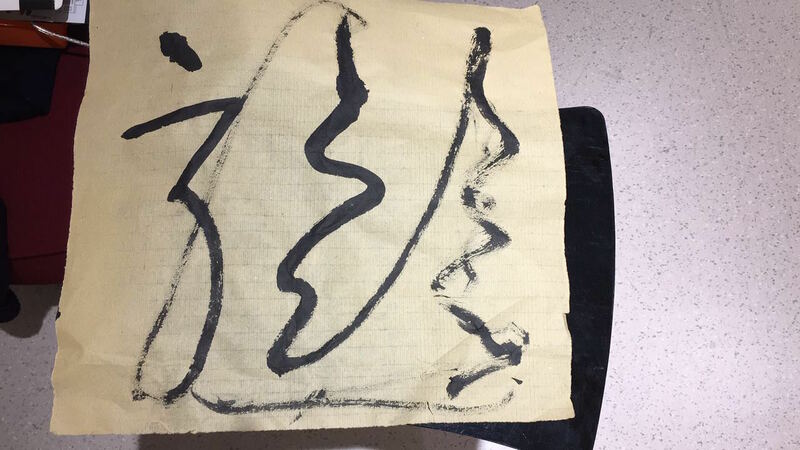 Therefore, this time，after several feedback and discussion with our classmates and professor, I have decided to write “crouching dragon, hidden tiger” with Chinese Calligraphy. My intention was to accompany with the music for the movie and edit the part with beats changed from slow to fast. 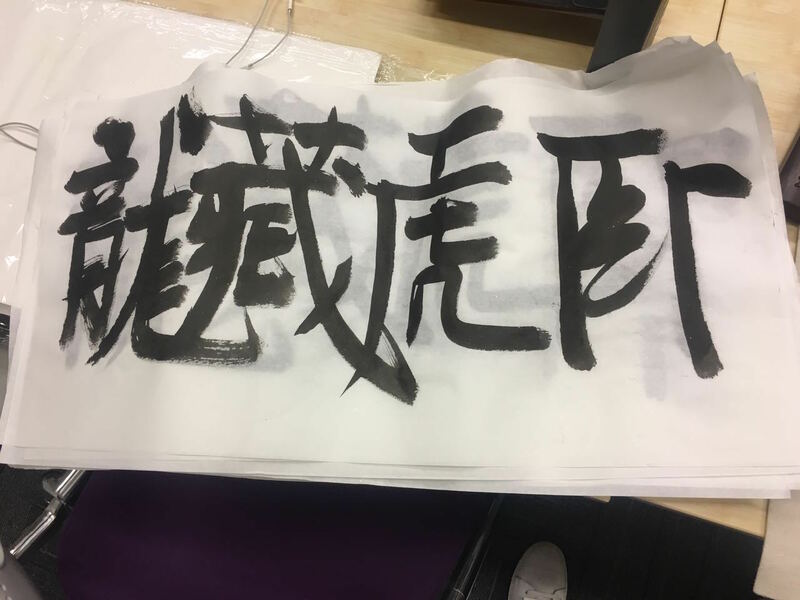 I thought it could be a perfect combination of Chinese calligraphy. My original idea was to use the web camera to detect which part is black and change the music when it is it senses the dark area. However, the idea of web camera might be not stable and sensitive to the environment. It also might be influenced by the movement of my hands and brush. 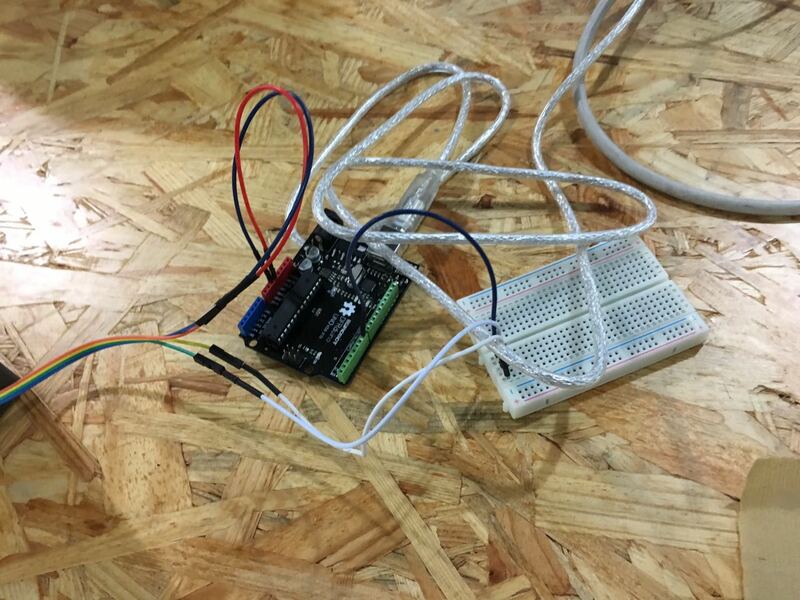 Therefore, I switched to the other idea– to use moisture sensor by the suggestion of Antonius. I borrowed four moisture sensors from the equipment room and located at each designed location of the cloth. I also use the cover of ink bottle to cover the Arduino and wires to eliminate the influence of LED lights. A huge difficulty I encountered is the data I got from the moisture sensor. It is not very accurate each time I dip on the rice paper. Therefore, I had tested lots of time and making sure that the data was within the “safe” range of ink. What`s more, I also borrowed a huge brush to add the dramatic element of Chinese calligraphy so that it creates the Chinese art atmosphere along with the music. Another difficulties was the design of music along with the position of Chinese character. I did get lots of inspirations from Antonius. He suggested me to cut music into three parts. So the first horizontal stroke, I started with the beginning of my music. Then, the music stops and I dipped the ink, giving the audience time to wait and react. I later started another vertical stroke, the music continued. The same for the third character. 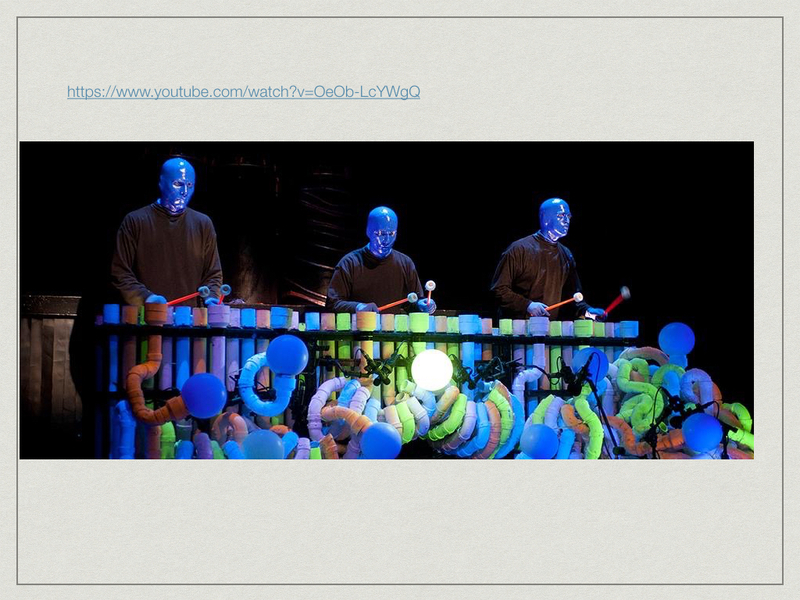 For the last one, I finished my performance with the one drum beat as I dipped on the last dot. I indeed practiced lots of time and I am still nervous when I was in the show. However, NIME was a fresh new experience for me. I have benefited a lot from the stressful assignments and I felt more creative after each week`s challenge. It was a great course. For this week, I have decided to do a theme about Chinese traditional art. I once watched the dragon dance and filmed the drum beat of dragon dance. 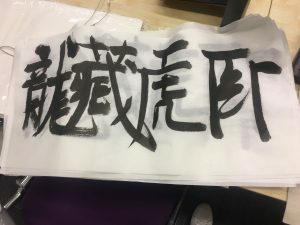 I wanted to combine the sample of dragon dance with the running style of Chinese calligraphy. The running style is just like dancing on the paper, the combination of drum beat is a good way to show my theme. Therefore, I have edited the sample I filmed from the dragon dance and cut the excerpt for three different speeds. I wanted to create an atmosphere that the drum beat can beat faster and faster as I wrote the whole character. 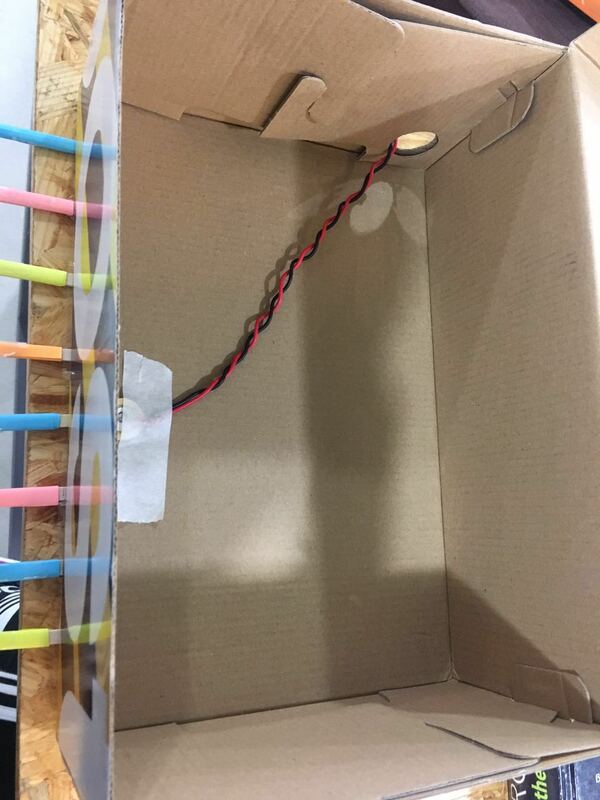 I borrowed an ultrasonic sensor from the equipment room and attach it to the ink box. 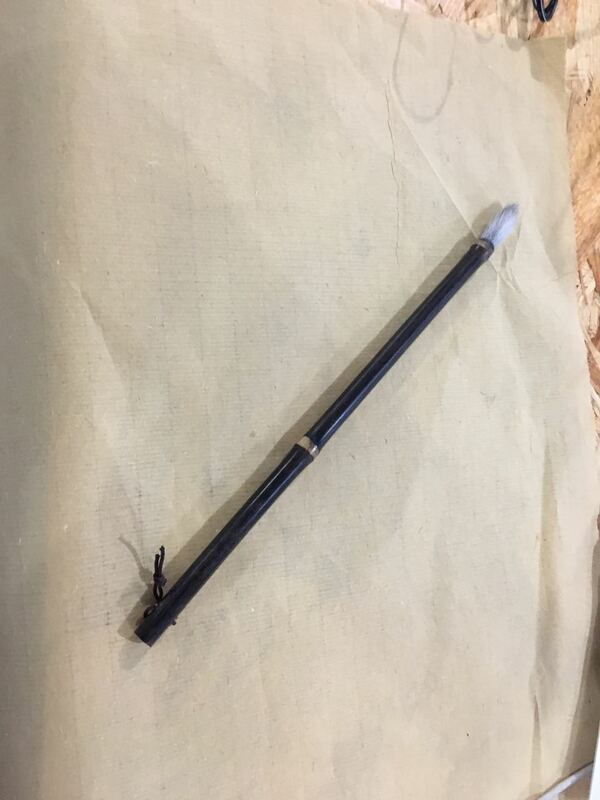 I placed it on the left side of the rice paper so it can sense the movement of my brush. 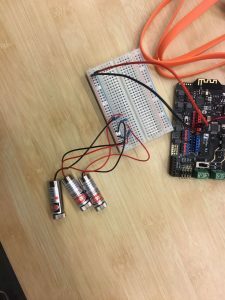 I have also assembled the circuit and it was pretty simple. 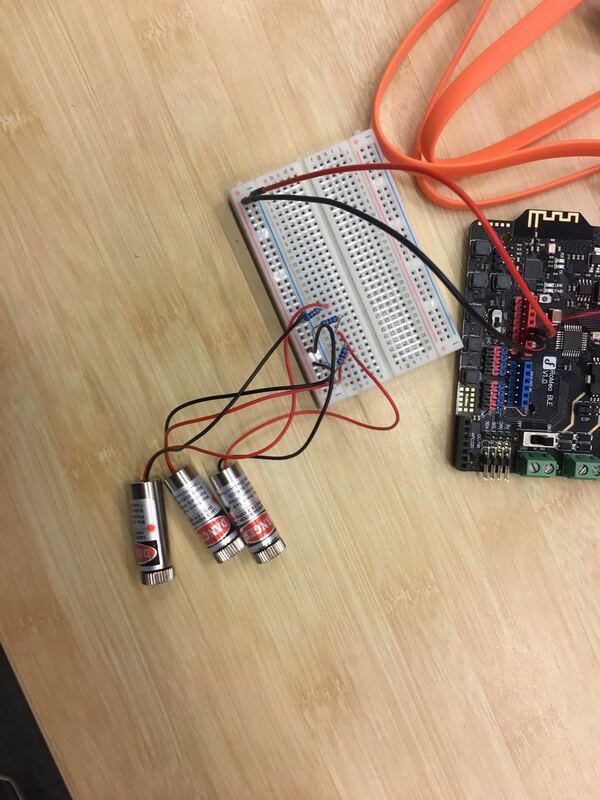 Jiwon told me to attach it to the breadboard so it can sense the distance and I have changed that. What`s more, the test of different distance is also another problem I encountered. I calculated the range of stroke of character and match it with the code in Processing. From the feedback of professors and students, I learnt that I need to rehearse and practice more. 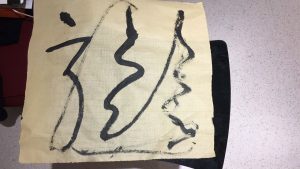 I had hesitations while I finished my last stroke because the rice paper moved and I didn’t see that coming. Therefore, from today`s performance, I learnt that I need to design from a coherent theme and rehearse more in case of unexpected situations. 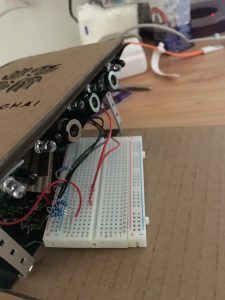 In week 2`s lecture, we learnt how to assemble 555 or amplifier. I chose to assemble the amplifier in class because I thought this might works together with my piesel disk. It took me a long time to finish this and it took longer than I expected due to the complicated circuit. Later for this week, I tried to dismantle the toy I brought to the class. The result looks pretty well. 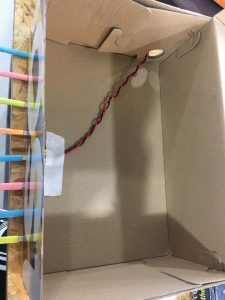 I have been able to explore where the speaker is and how the circuit works under the guidance of Antonius. I managed to create the rhythm by the “barf” of little dogs. However, unfortunately, I burnt the circuit one day before the performance. I have to think about new ideas. 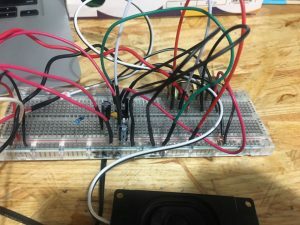 Thus, I tried to connect the piesel disk I made last class with the amplifier. I thought it might be a good idea to amplify a sound from my iPhone of laptop and combine it with the amplified sound from nature. Therefore, I have connected the piesel disk with amplifier on the same circuit. 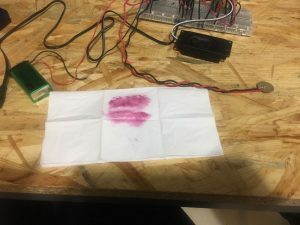 Last time, when we were asked to make instrument that amplified the sound of lipstick painted on the napkin. Whats more, Therefore, I have picked a song from a lipstick“I got you” advertisement and matched with the pound of lipstick on the napkins. I used it as the sound of drums and match with the rhythm of beats of the song. I had also received some suggestions towards my instrument last time. I should works on my performance perspective and improve on how the audience will perceive your performance. Therefore, for this time, I have tried to make the theme of lipstick advertisement as explicit as possible to the audience. 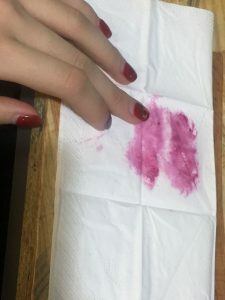 Thus, I have designed to paint the lipstick on the napkin and pick up the napkin, cover it on my mouth. I tried to show the normal lipstick advertisement content. After class, from the feedback of our classmates, I knew that audience may perceive different perspective with your theme. It might be a hard thing to let your audience know what you want to express immediately. Also, make the performance attractive all the time is also a thing to consider. 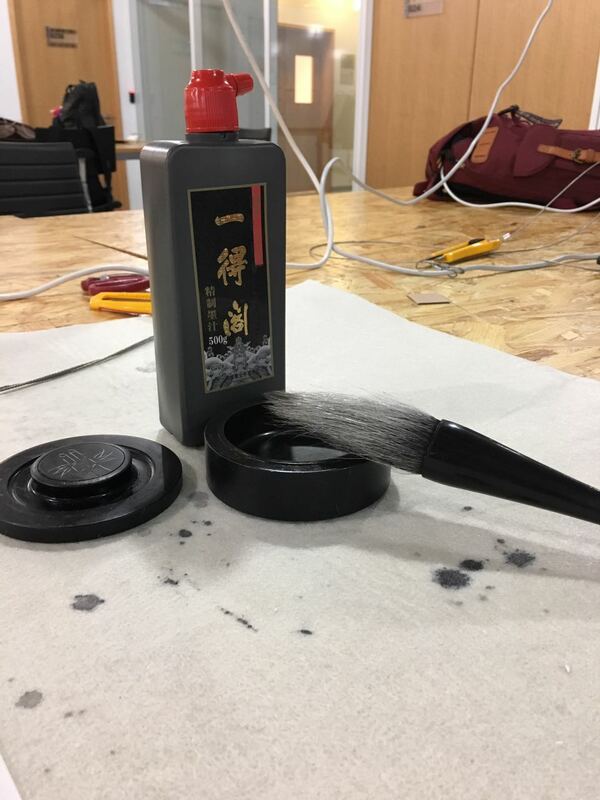 In first week`s class, we made a piesel disk in one hour. 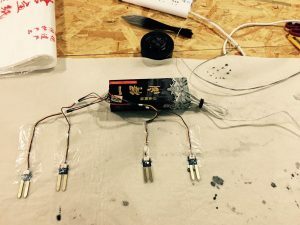 The process actually goes pretty well and we refreshed the skill of how to solder. This mic works pretty well and I decided to use that to amplify my instrument. 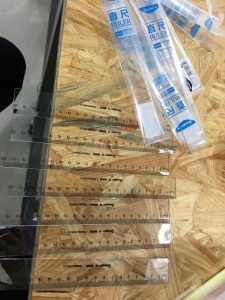 At first, I want to use rulers to play different notes by pressing them on the table. I first got this idea when I actually playing with my rulers while I was doing my homework. Therefore, I bought six more rulers from Walmart. However, the sound of notes was not delightful enough to be an instrument. This might be that the material of this ruler is too hard or is too wide. Therefore, I run to the Starbucks downstairs and grabbed eight coffee stirrers. When I pressed it on the table, it sounds much delightful than rulers. 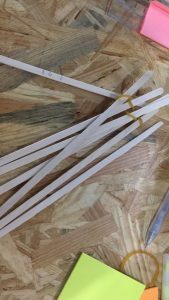 Then I started to test mark on the stirrers where the note is correct. 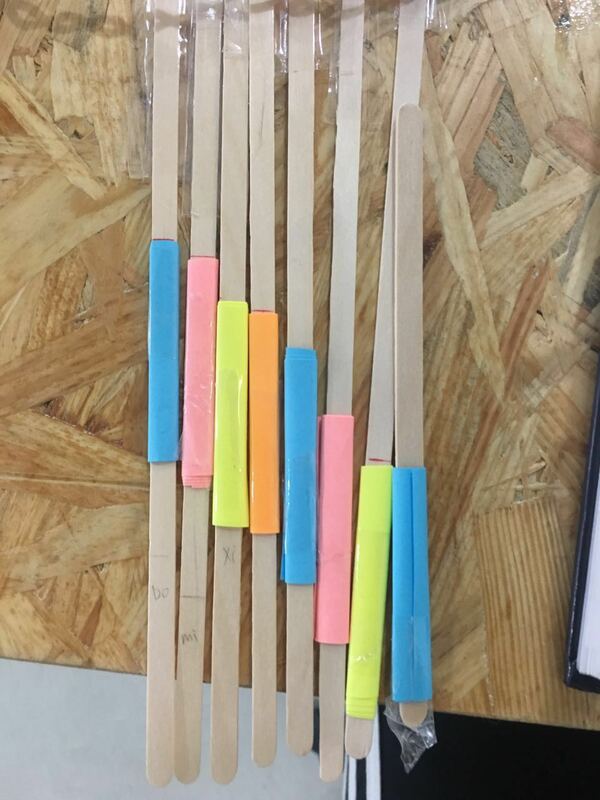 Then I cover the stirrers with note pads of different colors to represent different notes. 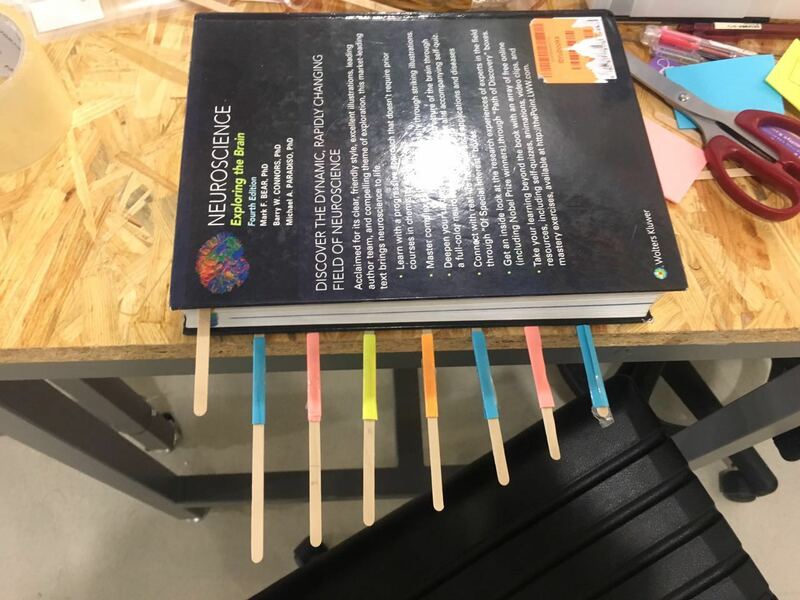 Then I tried to put heavy item on the stirrers (my textbook) and press them with my fingers. 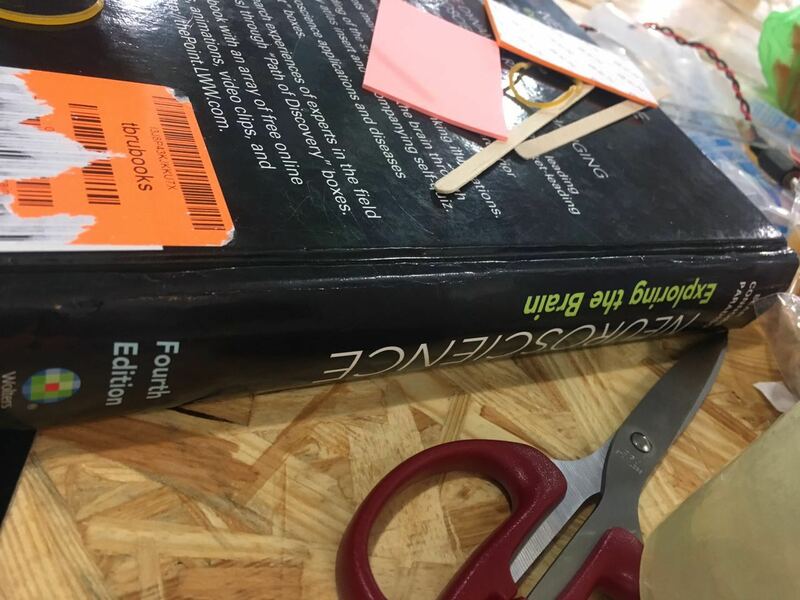 However, textbook did not conduct sound very well despite its appropriate weight. 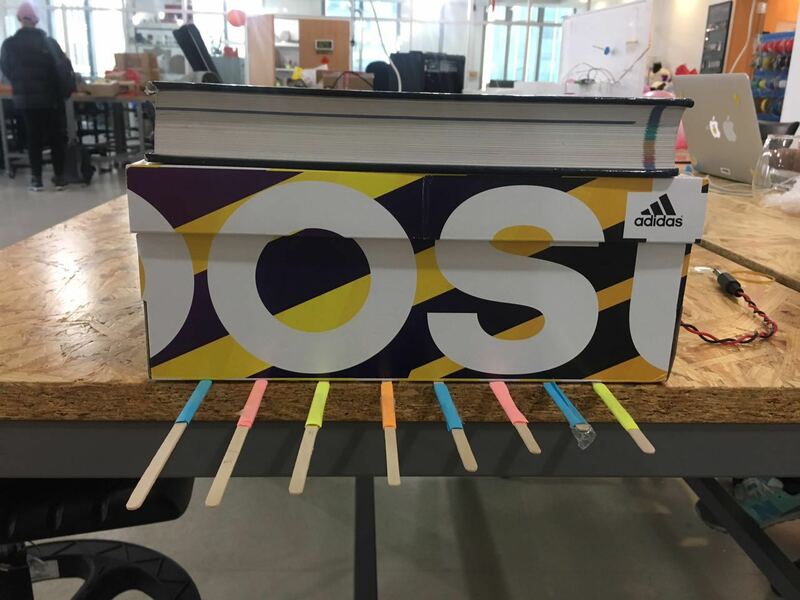 I grabbed a shoe box from my locker and put it on stirrers and press textbook on it. Shoebox is a perfect conductor for sound and I sticked piesel disk in the middle of shoebox. 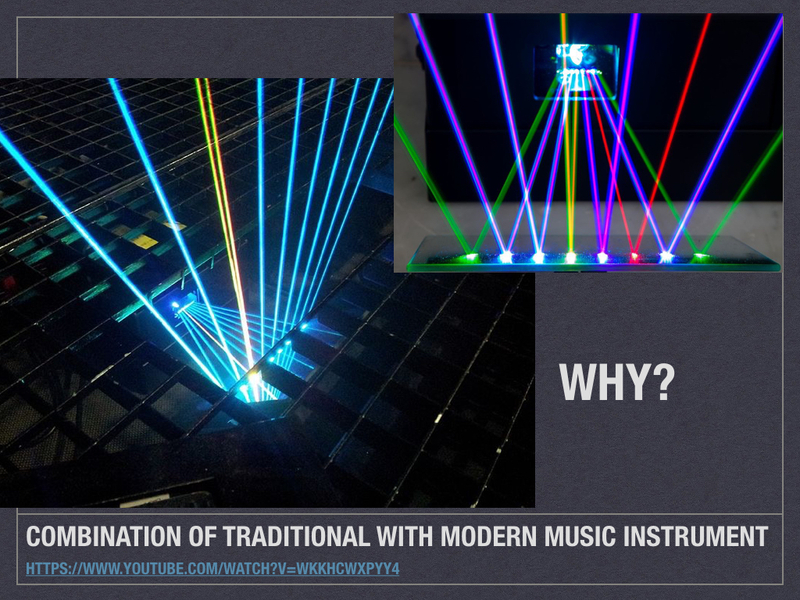 We are a generation that loves sound and light and we are particularly obsessed with the variations and changes technology can do to traditional art. 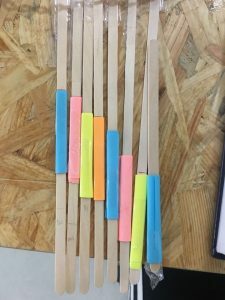 I am interested in expanding the idea of applying technology that we have learnt in class to create a new way to perceive the way we use music instruments. 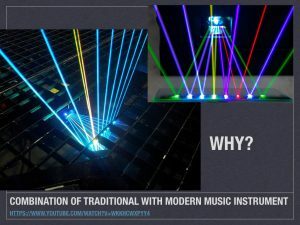 Therefore, I wanted to make an electronic Chinese zither/harp whose strings are replaced by laser. I collaborate infrared sensors, laser-cut frames, Processing and Arduino to produce the string. And each beam represents a note. The strings stretch from one end of the frame to another. Users can play the electronic Chinese zither by placing their fingers on the laser string and move around to play the melody. Apart from the fact that it can be a project that can be turn into a complete product, I also believe that the prospect of electronic music instrument can be huge. 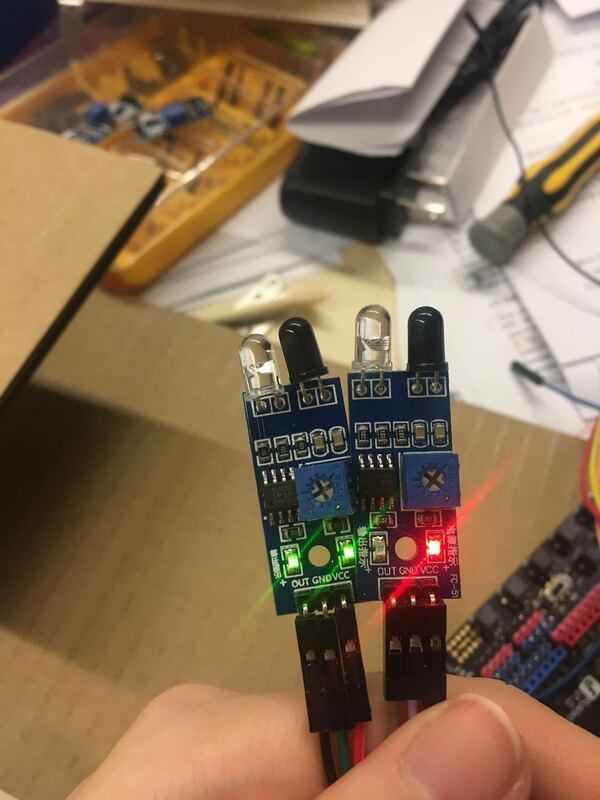 Not only can user interact with the electronic instrument, but also can do variation on the originality and improvement based on user`s preference. 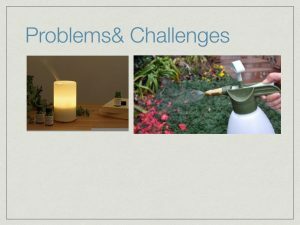 I decided to make a video clip instead of live demos because it would be more effective and efficient for really short presentations in class. I learnt my lesson from my midterm project that I lack time to present for the rest of my presentation due to a temporary technical issues. 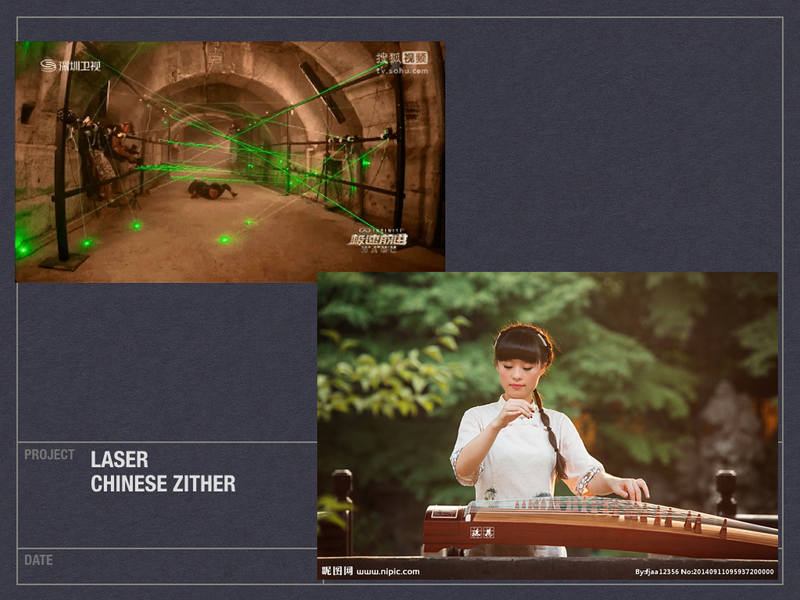 I used five infrared sensors and five laser emitters to combine as five notes of laser Chinese zither. 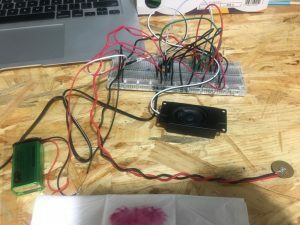 I chose infrared sensors to detect finger movements and borrowed laser emitters from lab to replace the physical strings. 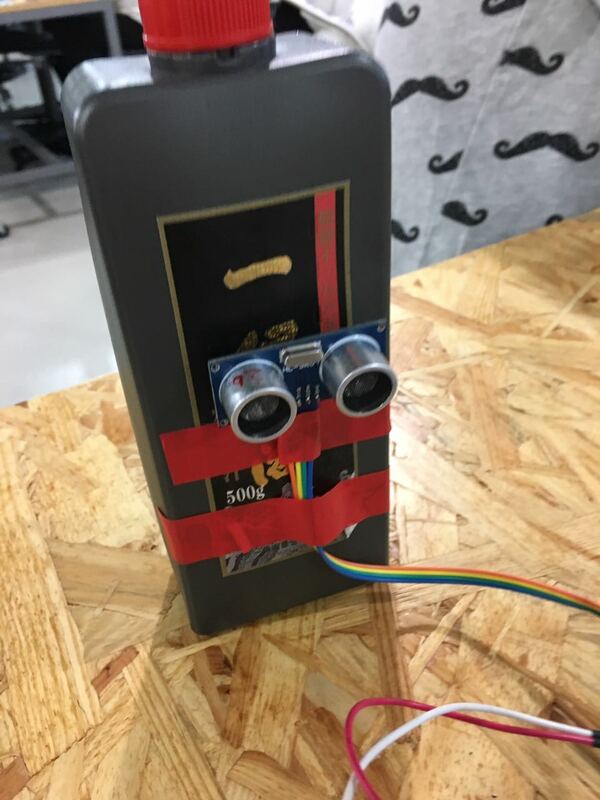 Whats more, the Arduino board in the Arduino box did not have enough digital spots. So I also borrowed a larger Arduino board from lab that have 11 spots. I have managed to attach all five of them on one side of the zither so that it can extend to the other end of the frame. 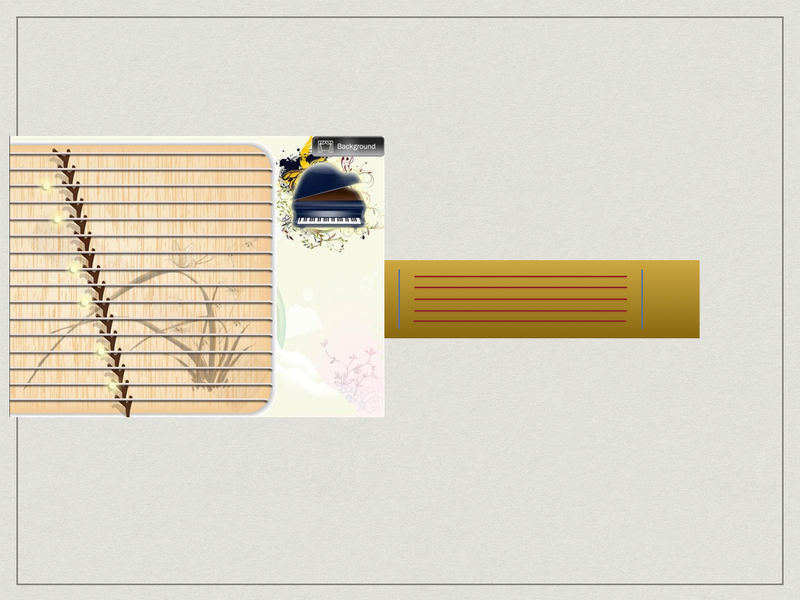 I downloaded live Chinese zither note online. 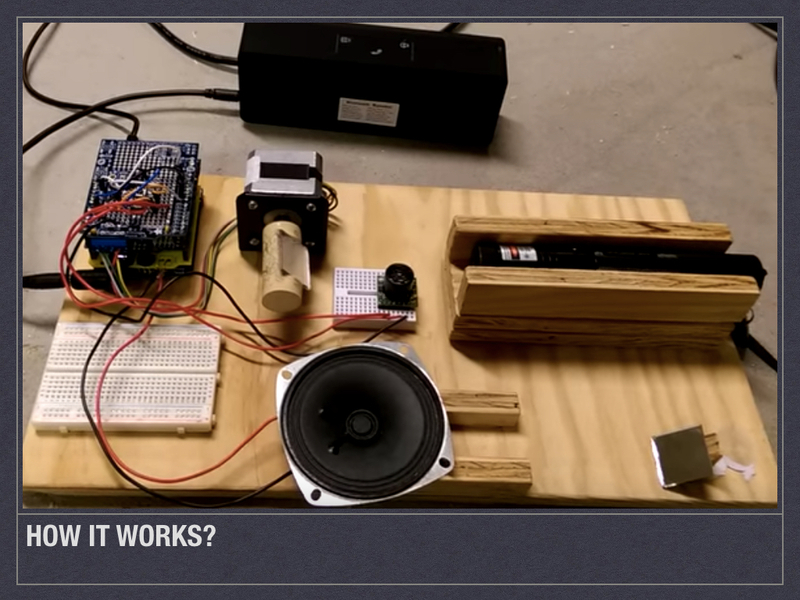 And I managed to play the note each time sensor sensed a finger in front of it. First of all, the adjustments of infrared sensors is the major part that I spent most time on. 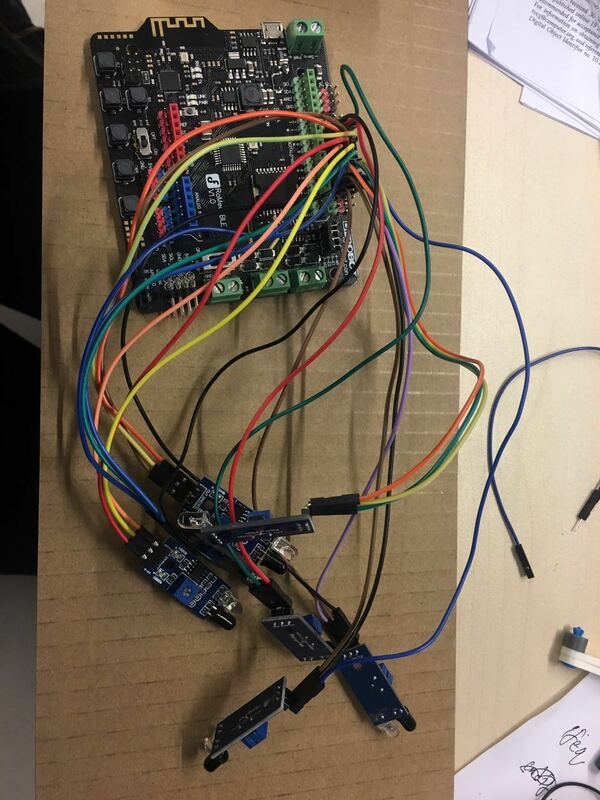 I borrowed seven sensors but two of them did not work no matter how I adjust it. 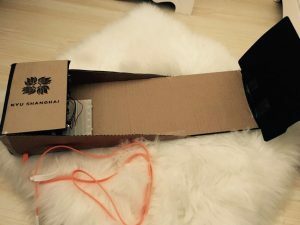 What`s more, I also wanted the sensing distance of the infrared sensors to be as far as possible. Secondly, I also struggled with the problem of how to make lasers visible in the dark because lasers required large particles to be apparent. I brought the machine that produce steam to assist the visibility of laser zither. The result turns out not as well as what I expected. I would try to use some larger fog machine or replace the laser emitters with greater visibility. I also had some trouble shooting demo videos for my project because the laser lines cannot be seen on the camera. Last but not least, producing a professional music instrument remix with modern elements can be more difficult than I expected. The combination of two hands corporation of Chinese zither and several other elements do matter. All those elements made Chinese zither so fascinating and pleasant to hear. 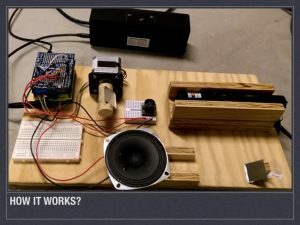 My ambition to make a professional music instrument still have lots of room for improvements. 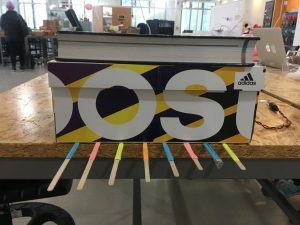 I really did benefit and learn a lot from the whole semester and also for this final project. 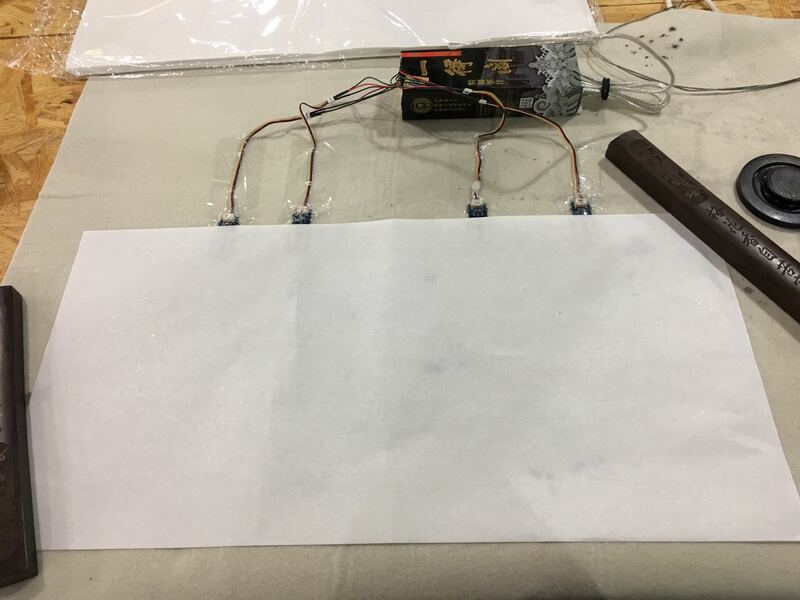 Like what Luisa said in our last course, we started from making paper board circuit in the first course and end it up with all those different projects three months later. Imagine what we can do concerning all the progress we made. I have learnt all basic tools we can use and seen how impressive result those tools can achieve. 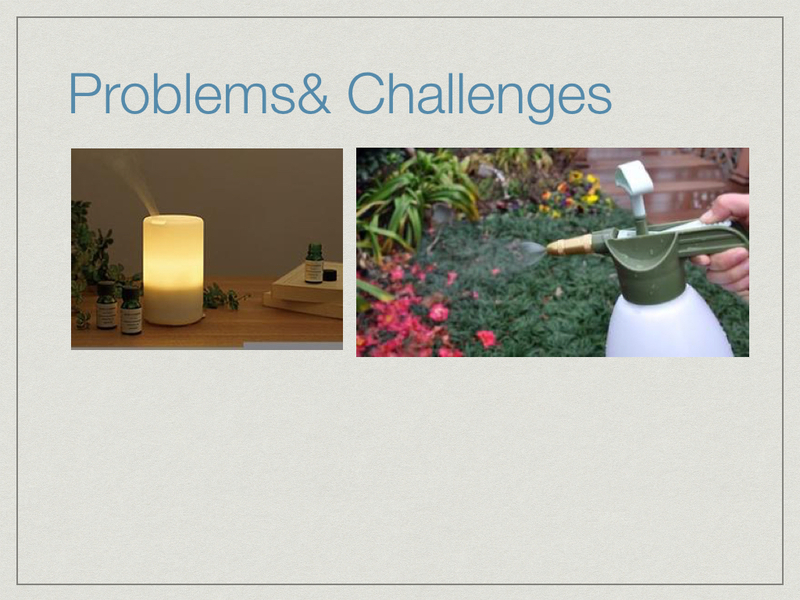 I think this course has given me courage to start on broader and more complicated projects. I also especially wanted to give special thanks to all IMA staff, fellow, professor Luisa. They are very nice and encourage me a lot during the whole semester. For this weeks lab, I designed the frame for my final project also for the practice of using laser cut machine. 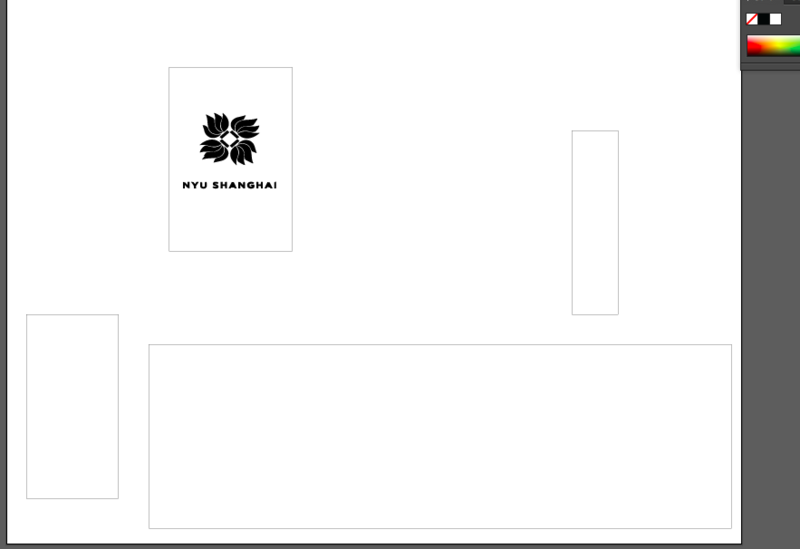 The most difficult part was the pattern of NYU Shanghai. 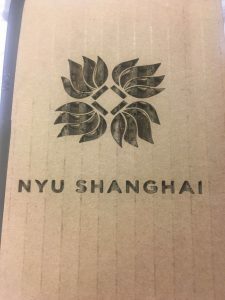 I followed the instructions on the IMA resources website to photoshop the original image of NYU Shanghai to make it identifiable for laser cut machine. I followed what professor Luisa taught us in class that we have to measure the size of the equipment beforehand. I also learnt that you cannot left the laser cut machine unattended when I actually used the laser cut machine. Because that might lead to fire or destructions on buildings or humans. 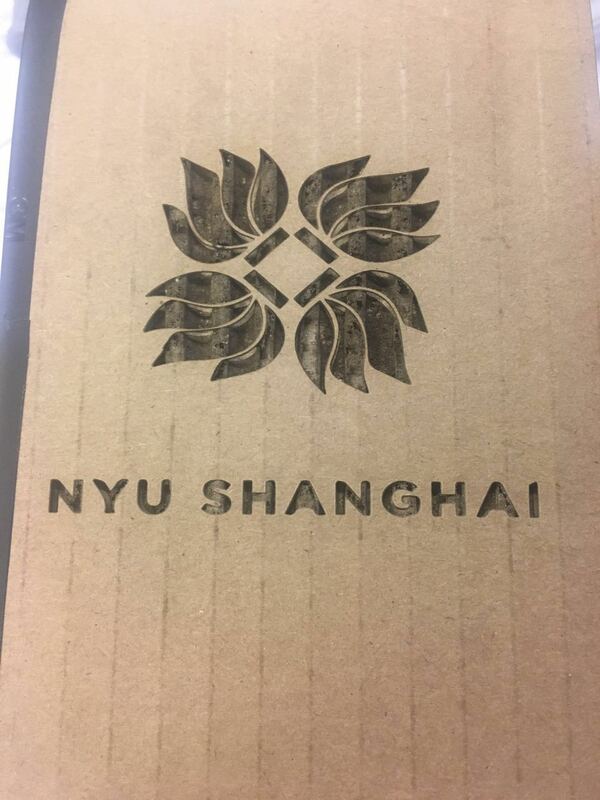 Keeping that in mind, I am very satisfied with the result of the laser cut machine. The article raised the important question: whether art on Instagram is considered as art or not. We have seen examples in class of a black and white photo that a man was standing in front of forests holding stick in his hand. Another artist remix it by replacing the stick with guitar and photoshop the man`s face and body to blue. We had discussion in class that almost all people agree that the latter piece would hardly be considered as a different work of art. From my perspective, the successfulness of this remix was the strong contrast between the modern elements such as guitar and dated style of background that he did not give credit for. And the issue in the article has the same issue. Richard Prince’s exhibition, New Portraits was simply adding his comment on the original artwork on Instagram and selling it at a high price. Although he claimed that “he not only added his own opaque comments under individuals’ pictures before he took screen shots, but also reported previous comments as spam, ensuring they disappeared (when viewed on his own account), pushing his own comments to the top – thereby arguably altering the original work”. However, even if his comments were brilliant and awesome, one of the main elements that make his remix successful is the original art piece. Therefore, what he claimed does not hold and what he remixed would not be considered a real art piece from my perspective. Whats more, Prince did not ask permission nor share the benefit he got from selling the art work. And this brings about another issue that whether Instagram is a public domain where you can manipulate everything that was posted on it. There are regulations on Instagram and same with Weibo, the Chinese social media, that anyone who felt uncomfortable of others using your work can file a report and waiting for Instagram to examine their report. But we can imagine the efficiency of that. The demand clearly outweighs the supply. I know in Weibo tons of bloggers right did not get effectively emphasized that even bloggers who especially established used to defend for those rights existed. And I can imagine how many cases were still unsolved in Instagram. Prince can serve as a case for us to concentrate on this problem arises with social media and probably advance our critical thinking of IP rights. I have to say that I really enjoyed the entire series created by Kirby Ferguson. He had started the whole series with tracing of history and evolution of remix culture by tacking different of collaborative collections. 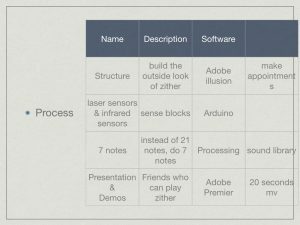 The last part of the series,titled ” system failure” elaborate on the essential issue of remix—the progressing “intellectual property” issue. It makes a timely comment on SOPA culture and timely comment of ACTA debates. One quote I like from the series claimed that “Our system of law doesn’t acknowledge the derivative nature of creativity. Instead, ideas are regarded as property, as unique and original lots with distinct boundaries. But ideas aren’t so tidy. They’re layered, they’re interwoven, they’re tangled. 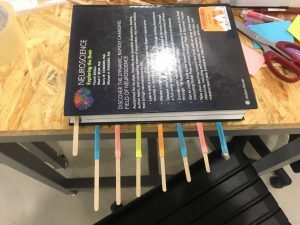 And when the system conflicts with the reality… the system starts to fail.” It can be a really good start on the psychological paradoxes of how we justify doing the copying but resent being copied. The work explores the dislocation of copyright and reminds us that the original Copyright Act of 1790 was entitled “An Act for the encouragement of learning” and to also examine on the idea of upholding an ideal of a rich public domain with shared knowledge open to everyone. I had enjoyed the time watching “the Yes Man Are Revolting” which offered a resonant understanding of these culture jamming ideas of them. In the beginning of “The Yes Men Are Revolting,”, the two are focusing on global warming and pretended to be political officials. Bichlbaum announces on behalf of US Chamber of Commerce that they are going to work against on global warming and the other one supports him by arriving in a giant inflatable ball. When Bonanno can’t get in, he ventures to the Capitol with other SurvivaBall folk, and hurls himself down the landmark’s steps. The meaning behind this culture jamming idea is huge because they have incorporate the idea of relationships and jobs and a good way to show their activism, too. They have wrapped itself up as an ode to friendship and the teamwork required to create change. Issues with “The Yes Men Are Revolting” mostly arise from the potential that this documentary’s wider scope invites. The overall Yes Man community inspires curiosity which extends far more than regard it as comedic documentary as entertainment. Their hoaxes with footage of news channels believing it can run with simply dressed-up madness and have unexpectedly making a point that is more rewarding more than any significant comedic experience. Personally, I can see Bichlbaum & Bonanno to be not only entertainers but also activists who have done a great job at character-building. In his TED talk, professor Shirky made a convincing point on the serious problem of Stop Online Piracy Act(“SOPA”) /Protect IP Act(“PIPA”) which is the shift of burden of proving things or finding evidence. Though the two heavily debated pieces of legislation that dominated blog headlines these past few weeks, lawmakers will continue to work to pass bills with the intent to combat online piracy. With that in mind, professor revisits the potential consequences of passing SOPA in its current form. He had began telling the story of a bakery unable to let children draw pictures of television cartoon characters for their cake decorations. He said in the TED talk that, “In the end, the real threat to the enactment of PIPA and SOPA is our ability to share things with one another,”He then gives an abbreviated history of the media lanscape and the legislation it lobbied for along the way. He then made his point:“It turned out, we’re not really couch potatoes, and we don’t really like to only consume. We do like to consume, but every time one of these new tools came along, it turned out we also like to produce and we like to share. And this freaked the media businesses out, it freaked them out every time.” PIPA/SOPA marked the shift of burden of proving things. Under those, all consumers are treated as illegal unless they made their way to prove themselves as innocent. Therefore, the burden of proving themselves innocent have moved the burden to us, consumers. Professor Shiry claimed that PIPA/SOPA are indeed problematic and I agreed with that. The restrictions and burdens can have a negative effect on remix art. Just as Shirky claimed at the end of the talk, people are not satisfied to be a consumer only. However, they want to consume based on what they had produced. I really appreciated that Lessig offers in his article a different perspective that the copyright law should actually be changed in order to generate good remix pieces, unlike other readings we read before. He not only stated his ideas about how to make RO and RW culture better off in the future and listed five potential improvements of the copyright law. In his first change about the law, he stated that we should use a matrix to illustrate and deregulate amateur creativity. I appreciate the matrix since this can reduce costs for remixing and therefore people will be more incentived to create more remix pieces. The second change Lessig proposes is about the maintenance of the copyright licenses. He claims that the copyright law should grant the fair use for file sharing. The third change Lessig argues is to simplify the copyright law. Last but not least, he claims that the copyright law should grant the fair use for file sharing, if it is for non-commercial purposes. I agree with Lessig that those five changes will eventually reduce a great amount of legal procedure for commercial work. What`s more, Lessig shows a lot of unsatisfactory towards the government. However, Lessig seems to be a little too aggressive on this point. The line of reasoning of his claim appears to be a little bit flawed. Overall, Lessig elaborates on the idea of remix but he took an aggressive position on reforming law. He claims that “If copyright regulates copies, and copying is as common as breathing, then a law that triggers federal regulation on copying is a law that regulates too far”. I think that he should have concentrate a little bit more on rights of original artists. 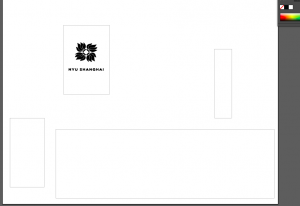 For our final project, our ideas have shifted a lot from the very beginning. We finally settled our proposals on expressing the idea that woman should not be restricted by social norms by remixing disney princess with Beyonce`s pretty hurts. We were inspired by the current news of Victorias secret fashion show and were reminded of the campaign “perfect body” they had in 2014. The slogan “the perfect body” appeared with images of Victoria’s Secret angels on the company’s website and in stores in the UK. The company received lots of critics and petition for calling it offensive and disrespectful of various values women had. The company had changed the slogan to” a body for body” and some other companies had also posted their advertisement using models who have different body sizes. We have realized that society has gradually accepting different standards and values throughout time, especially in how society perceive as beauty. We used to think of super models–those with skinny waist, long legs and big chest– as the standards of beauty. And whats opposite towards those standards were perceived as “ugly”. But as for recent years, girls who have their own special beauty would be considered beauty as well. Another evidence for this transformation is the different characteristics Disney princess had. From the very beginning, Disney princess such as Snow White, Cinderella and Aurora etc they all have big eyes, pale skin, mostly blonde hair and almost flawless appearance. But during the recent 20 years, Disney Studio had surprisingly corporate different style of princesses such as Mulan, Ariel, Jasmie etc. They don’t have fancy dresses and flawless look to be a princess, but they are positioned as Disney princess without doubt. Therefore, we have finally made up our minds to expand on the idea of how disney princesses have showed the transformations of social standards and to incorporate with the audio of Beyonce`s pretty hurts which fits best with our ambition. During the process, Zeyao was in charge of editing parts of videos with the lyrics and I was in charge of searching all video clips to decide which points would fit with the lyrics. For me, I had a hard time to looking for all raw materials that fits perfectly with the intention of having a beauty contest for all princesses. Later, we decided to simplify our goal by having just showing the struggles of princesses contrasting with Mulan. I found 33 different video clips from Youtube for Zeyao and marked all points that expresses the lyrics of the song. Zeyao, of course, also go through lots of difficulties. He spent lots of time adjusting the faces of princesses to the right places from one scene to another so that they looked like one music video. What`s more , adjusting the perfect timing for video clips is another struggle. It appeared easier said than done. Even some tiny scenes may take almost an hour to adjust so that they would fits with the lyrics. Last but not the least, beats of music video are also essential. So we also spent lots of time to match the movement of princess and with the beats of music. From my perspective, we chose video as the platform for finals because we did have great time editing our midterm project and we wanted to bring our project to a meaningful level. Thus, we chose to make a remix music video instead of a family photo book. We both felt stressful during the process, but enjoyed seeing the final product we had. We hope this would be a good closure for this semester. In this weeks lab, we are required to use Processing and OpenCV, move an image or a drawing on a screen using face/ color/ leap motion. I found Open CV is really interesting and I am extremely interested in the interactions the face create. I am also interested in how to make special effect Snapchat did for example: add some bunny ears, dog noses etc. Therefore, I have decided to make a pig nose that moves with my nose. I downloaded a picture of pig nose from website which does not have white background. I have succeed to add this image into Processing by using the sample from the IMA link and adjust the image size to the right size of my nose. But I was having trouble moving the pig nose with my nose. During the recitation, I saw what Joshua did with open CV. He managed to move Trumps face along with his face and it was very brilliant. I also asked his help and realized that I wasn't using the right variables of pig nose "image(Nose,posX-a/3,posY-b/10,150,100)". After figuring out my problem, I was able to move pig nose successfully. From what we have learnt over this semester, I was especially fascinated with the idea of user-interactions. Where products you have designed are greatly dependent on your user-reactions. In this case, you base your product on how user have perceived and improve your product depend on the user`s reactions. The idea of interaction can expand if we incorporate technology and software. There are tons of people who have already made great project of laser harp. 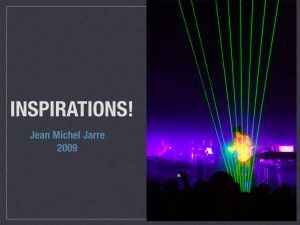 Jean Michel Jarre showed the most popular interactions and also the very first laser harp very early in 1981. 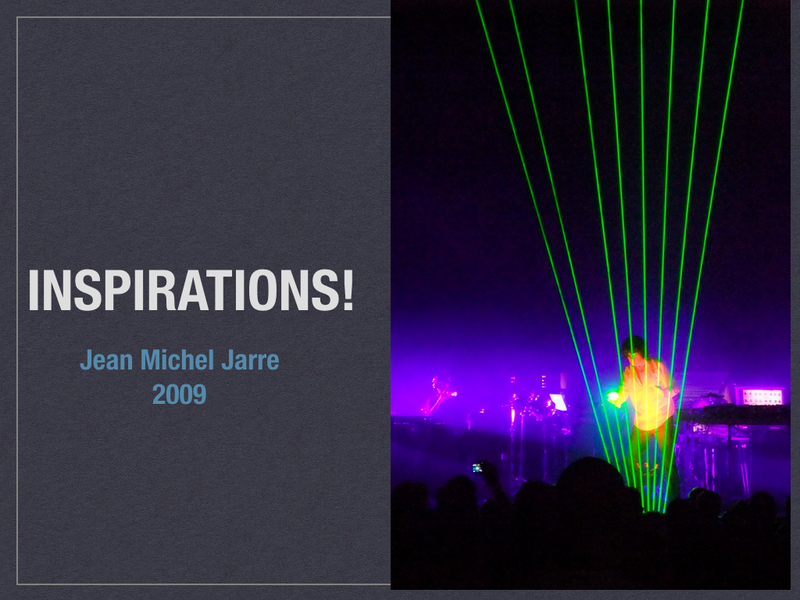 He used laser harp as a high profile feature in his concerts as the main melody and corresponded with the band. Throughout years till now, tons of people have created their pieces of their own with their preference of playing it. Some still were based on the idea of unframed harps and used it in art installations. Some would make framed harps just like what I would do by combing the Chinese elements that I am familiar with. Users thus can play harps by blocking strings to produce different notes. I think this is what interactions is all about and also what we have learnt during the whole semester in Interaction lab. We are all in the class, studying the same techniques and the same materials, yet we had various and such brilliant projects turns out at midterms and possibly finals. We made our own products based on our interactions with the world and put our understanding and preferences into our projects. And this will in turn create good interferences and interactions with people who had the same understanding of the world with you. I think that is why interactions are all always so fascinating.